I fear I made a mistake this Halloween season. Or not. It depends on how you look at it. In passing, I mentioned the existence of a Candy Monster. 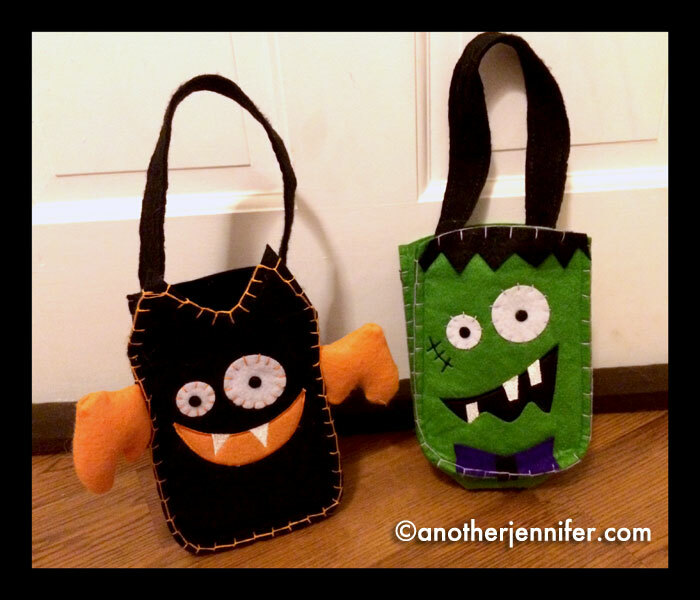 I was putting up our Halloween decorations and I was left with two cute bags that I decided to hang on my boys’ bedroom doors. “Mom, why did you put the bags on our doors?” asked Biz. “So the Candy Monster can come by and put candy in it,” I replied. I didn’t think much of it. I like to mess with Biz. He’s sarcastic, like I am. He’ll pretend he’s afraid of the dark because he doesn’t want to walk up the stairs for something, and I’ll tell him to turn on the lights so the monsters won’t get him. I’m supportive like that. I’m going to have to explain a lot to his future teachers. My guess is that about 50% of what he says is truth, while the other 50% is just made up to see if people will believe him. They usually do believe him. He’s a good storyteller. I didn’t think much of the comment until a day or two later when my husband noted that Biz had been checking his bag to see if anything was in it. After telling G about the Candy Monster, he started looking too. They mentioned the Candy Monster a few times before Halloween. I was vague about the Candy Monster’s existence. I felt a bit guilty about that comment until I remembered Elfie. If that stupid elf can keep my kids from misbehaving during the holiday season as long as I remembered to move him (or come up with a good enough excuse for his lack of movement), maybe a candy stealing monster wasn’t so bad. Especially with Reese’s Peanut Butter Cups in the house. Did I just come up with a million dollar idea? Could the Candy Monster be the next Elf on the Shelf? The thing that everyone thinks they want until they find out too late that they’re stuck with a new holiday tradition until their kids are old enough to figure out that it’s all a big ruse? Or maybe it could be the opposite of Elf on the Shelf. The Candy Monster could justify moms and dads eating their kids candy while they sleep. Still, I’m not sure I have the energy for another lie holiday tradition to keep up for my kids. I ended up putting a piece of candy in each of the bags the night before Halloween. I’m not sure they would have remembered to check had I not mention the fact that it was Halloween morning and the Candy Monster just may have been in the area. Will they remember the Candy Monster next year? That remains to be seen. What do you think? Should I keep it up or hope they forget about the Candy Monster all together? p.s. Don’t be stealing the Candy Monster idea and selling it to investors. Not without me, anyway. Love it! A great idea for parents to steal candy! Hehe! We only had one that went out this year and the dog stole most of his! Fortunately my in-laws gave us their extra chocolate. Michelle recently posted..Bitten by the Cross Country Bug? My dog ate about 20 Reese’s Peanut Butter Cups one year. He stole them from the top of the refrigerator! It was terrible. I do love this idea! And yes, it is a great excuse to eat the candy while the children are sleeping… except Im already eating most of their candy when I’m awake!!!! Ha! I typically wait until they are sleeping or out of the house (it helps that I work from home!). Just read your last comment and you should definitely write a book about it with your kids! The only traditional “lie” my parents maintained for a bit was the toothfairy….though I caught on pretty fast (about the 2nd or 3rd time I lost a tooth my did whispered in my ear “Beverly, it’s the tooth fairy!”), I still didn’t mind finding little gifts the next morning. I’m kinda thankful I don’t celebrate Christmas and have to really worry about Santa or Elf on the Shelf, but I like this candy monster idea! Holy crap! It’s a million dollar idea! Elf on the shelf was big because parents needed something to help them keep their kids in check. You have just won the parenting game, lol. (um, not that I know a whole lot about what I’m talking about..unless you include dogs or cats, haha). I love those little bags, too. You are too funny, Cyndi. Maybe we should start working on that book and I can try and track down who made those bags! Love your idea of YeRoWriteO. My best ideas come in the shower so it’s not surprising. Would love some extra motivation for the writing project I should really be working on! I’ll stay tuned. I love any idea that allows me to steal candy. I think it’s a win, win for everyone! I think it’s a good idea! I guess you can see if they remember next year. My guess is that they very much will, because kids are amazing at remembering stuff like this, but if you want to know where their shoes are, you’ll never find out. Tamara recently posted..That’s Just The Way It Is. So very true. With us it’s socks though. If they’d only put the darn things on their feet, they might not forget where they are all the time! Oooh! The candy monster! That’s brilliant. Just don’t tell my kids. I don’t know if I can keep up with another tradition in our house!! Rabia @TheLiebers recently posted..Meeting Glennon from Momastery! I think it is a great idea! It could be the next big thing…start writing that book now! I could be a whole series! I’m not even sure why I brought him up. I guess that’s what I get for messing with my kids! Oh man, if only I had the time. Maybe I can put my kids on the project. Is that child labor? I think you just started a great new tradition for your family! Love it! It’ll be interesting to see if they bring the Candy Monster up again. I have a feeling they will! I think the book idea mentioned before is a great idea. Wouldn’t it be interesting if I walked into a bookstore just before Halloween next year to see a Candy Monster book with a cute bag next to it to take home. Yep…sounds like a great idea to me. Hmmmmm. As long as my name is on it. 🙂 Thanks for stopping by! hahaha! Sounds like a brilliant new idea to me!